From the back of the BOCD: A spellbinding amalgam of murder mystery, family saga, love story, and financial intrigue. It's about the disappearance forty years ago of Harriet Vanger, a young scion of one of the wealthiest families in Sweden...and about her octogenarian uncle, determined to know the truth about what he believes was her murder. It's about Mikael Blomkvist, a crusading journalist recently at the wrong end of a libel case, hired to get to the bottom of Harriet's disappearance...and about Lisbeth Salander, a twenty-four-year-old pierced and tattooed genius hacker possessed of the hard-earned wisdom of someone twice her age who assists Blomkvist with the investigation. This unlikely team discovers a vein of nearly unfathomable iniquity running through the Vanger family, astonishing corruption in the highest echelons of Swedish industrialism, and an unexpected connection between themselves. Contagiously exciting, it's about society at its most hidden, and about the intimate livesof a brilliantly realized cast of characters, all of them forced to face the darker aspects of their world and of their own lives. My sister sent the audibook to me for Christmas a year ago and it's been on Mt Git'r'Read ever since. I have absolutely no idea why I waited so long, but I did. I read so many fab reviews that I knew it was time....that and I didn't have any audiobooks from RecordedBooks since I've been mowing through them the last week or so. I pulled it off the shelf last week and listened to it at work. WOW! It was a superb book to listen to and I cannot wait to listen to the other two. The book does start slow, as I'd been warned it would, but when it picked up, it SMOKED! It's a well told mystery that's actually several mysteries going on throughout. My favorite character is Lisbeth Salander. She's tough and smart, with a big ol' chip on her shoulder, but I think it's a well deserved chip. There are scenes that are not for the faint of heart whatsoever. I even had to grit down and take a walk after listening to one particularly horrific scene. 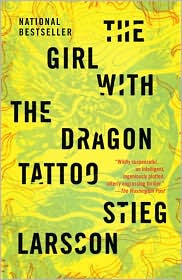 It is very sad that the world has to make do with only three of Stieg Larsson's books. He died just after he submitted his three manuscripts in 2004. I'm glad that you liked this book Vickie. I imagine those horrific scenes may be harder to listen to than read. My favorite character is Lisbeth also. I think you'll like the second & third book as well. It's sad that there are only three books in this series. Larsson was a gifted writer. Bonnie: I think it was more intense to listen to some of the scenes. I couldn't skim them like I might if I was reading a handheld. I concur, Larsson was amazingly gifted. My husband is reading this now. I hope to get to it within the next month or so. So glad to see 5 beans!